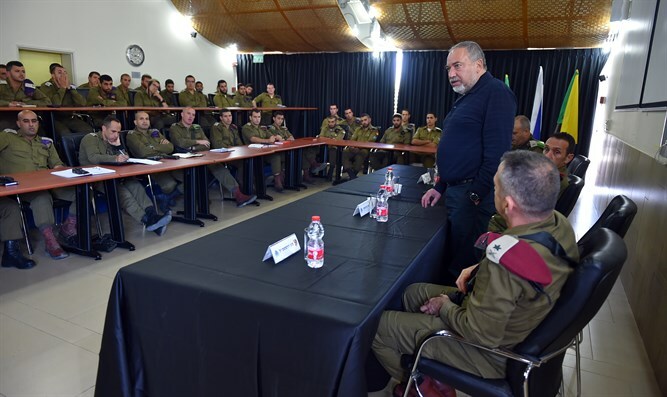 Defense Minister Avigdor Liberman held an assessment of the situation in the Gaza Division with Deputy Chief of Staff Maj. Gen. Aviv Kochavi, Southern Command Commander Major General Herzi Halevi, Commander of the Gaza Division Brigadier General Yehuda Fuchs, and brigade and battalion commanders, later meeting with soldiers. "We are not prepared to accept the level of violence that we see week after week, and right now we must understand the other side as well - we, the State of Israel, the defense establishment, did everything in order to reach the situation of March 29, before the outbreak of the violence, pleasantly,” Liberman said. "Whether in the use of force, or in persuasion, or in cooperation with the international community and UN institutions and with anyone who just wanted to come and help solve the problem. We have exhausted all the options, all the possibilities, and now the time has come to make decisions." Liberman made it clear that this position is what he says from every platform. "We must strike Hamas hard, and this is the only way to bring the situation back to normal and lower the violence threshold to 0 or almost 0, or to the level of March 29. This must be a cabinet decision, unfortunately, neither the defense minister nor the prime minister, nor the prime minister together with the defense minister, alone can make such a decision." He explained why he changed his attitude toward terror in Gaza. "When I'm asked what has changed, what happened suddenly, why now, there's always a moment when you have to make a decision. For me, this moment is what happened last Friday. After we allowed UN personnel to bring in four fuel tankers in the morning, in the evening we received a burst of violence, a wave of violence to an extent that I do not remember for a long time." He hinted at disagreements in the cabinet regarding the desired action in Gaza. "As far as I am concerned, there is only one formula: rehabilitation in return for demilitarization. We tried all the options, I said, I think that we have reached the end of this stage. At the moment, we have to make decisions and I hope that the cabinet will make the right decisions."